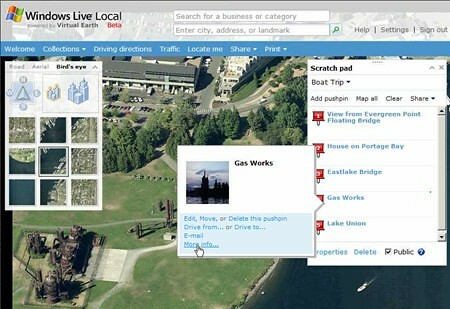 I'm really impressed by the new Local Live release (you'd might say 'you would say that' 'cause I work at Microsoft. But I mean it)...I got so excited by one feature Tommy showed me (adding pictures to Collections) that I made this screencast to show off some of the new features in this release (including the real-time traffic data provisioned by provisioned by Traffic.com). Here's my Kirkland - Seattle boat trip collection I showed in the screencast. Over as MSDN you can get the new API and Map Control and Interactive SDK, now including support for Collections, geocoding, routing, GeoRSS feeds, Yellow page searching, international support, Interactive SDK. The Local Live team blog has more info on the features. More postings at Lifehacker, Inside Microsoft and TechCrunch. Aargh! You missed one of the important features: you can click on the thumbnail in the popup to see the picture itself without having to go to the More Info… link. That’s why the size does matter because you can load the picture right there without hopping over to Flickr or wherever else. Doh! I didn’t realize that. Thanks!